Aldo Leopold famously described the curse of an ecological education as “to be the doctor who sees the marks of death in a community that believes itself well and does not want to be told otherwise”. Ecologists do have a tendency for making dire warnings for the future, but for anyone concerned about the myriad of problems currently facing the Earth — climate change, an ongoing wave of species extinctions and impending peak oil, phosphate, water , (everything?) crises – the continued ignorance or ridicule of such warnings can be a frustrating experience. Environmental degradation and ecological overshoot isn’t just about losing cute plants and animals, given the widespread acceptance that long term human wellbeing ultimately rests on the ability for the Earth to supply us with ecosystem services. In light of this doom and gloom, things were shaken up a bit late last year when an article1 published in Bioscience pointed out that in spite of declines in the majority of ecosystem services considered essential to human wellbeing by The Millenium Ecosystem Assessment (MA), aggregate human wellbeing (as measured by the Human Development Index) has risen continuously over the last 50 years. Ciara Raudsepp-Hearne and the co-authors of the study suggested that these conflicting trends presented an ‘environmentalist’s paradox’ of sorts – do we really depend on nature to the extent that ecologists have led everyone to believe? The article has generated quite a bit of attention, as it challenged one of our most fundamental perceptions of our relationship to the natural environment. If it were possible for humans to supersede nature, then our current march through the anthropocene and into a four or six degree hotter world shouldn’t be of much concern for us (biodiversity might not be so lucky). Raudsepp-Hearne and colleagues tested four main hypotheses to try to explain this finding: that well-being is not measured correctly, provisioning services such as food production, which are increasing, are more important for well-being than other services, technology has decoupled humans from our relationship with nature, and the prospect of a time lag in humanity’s response to diminishing ecosystem services. The article has been discussed in more detail in a more recent issue of BioScience, where Anantha Duraippah pointed out (and as hinted at by Tim Beardsley in the original editorial) that aggregating estimates of human wellbeing at the global scale can mask declines and inequalities across sub-global and country-level scales. Duraippah also questioned the reliability of the Human Development Index (HDI) as an indicator of human wellbeing, and pointed towards findings of the recent Stiglitz Report on the Measurements of Social and Economic Progress, commissioned by French President Nicolas Sarkozy. The report identified numerous factors that make up wellbeing: those that can be measured objectively including employment and income, and subjective measures such as emotional happiness. Both types of measures – objective and subjective, were regarded as critical to obtain a well-rounded view of society’s genuine progress and well-being. The response by Gerard Nelson argued that better technology, data and economic accounting will help to resolve the paradox, while most commentators across the blogosphere (see here, here, and here) focussed mainly on the final hypothesis proposed by Raudsepp-Hearne to explain the paradox – the expectation of a time lag in humanity’s response to diminishing ecosystem services. Technology (or more likely, cheap fossil fuels) and social innovation may be contributing to this time lag, and perhaps delaying the onset of a tipping point in ecosystem function and subsequently human wellbeing. Interestingly, there have also been some comments (here and here) from an alternative perspective – that humans simply don’t rely on natural resources to the extent that environmentalists purport, and the continued positive trend in HDI in the face of environmental degradation is confirmation of this assertion. The environmentalist’s paradox is not a paradox, because global growth in human capital (such as knowledge and individual skills) is substituting for our reliance on natural capital – ultimately meaning that human wellbeing will continually improve without restriction. To better understand this argument, it is worth looking at the issue from first principles – beginning with the circular flow model of mainstream economic theory (Figure 1). Here all economic activity is considered to be contained within a whole, self-contained system, where the environment is a subsystem of the greater economy. Resources produced by the environment (i.e natural capital) are converted to human capital during the economic process, but environmental degradation associated with this conversion is not necessarily a problem since human made capital could effectively substitute for the loss of natural capital. Increased efficiency in the conversion of natural to human capital, coupled with technological advancements, mean that according to this viewpoint the economy can increase in scale without any limits, and as such human wellbeing can continue to increase indefinitely. 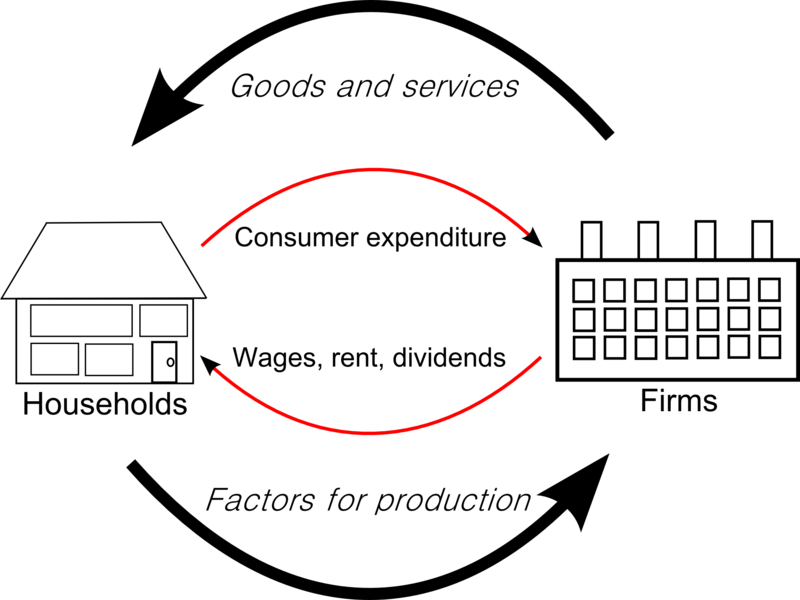 The main problem with the circular flow model is that it is effectively a perpetual motion machine – a model that violates basic physical laws such as entropy and the conservation of mass and energy. Viewing the economy as a whole, isolated system that generates no wastes and requires no additional inputs is like describing an animal in terms of its circulatory system, but ignoring its digestive tract2. 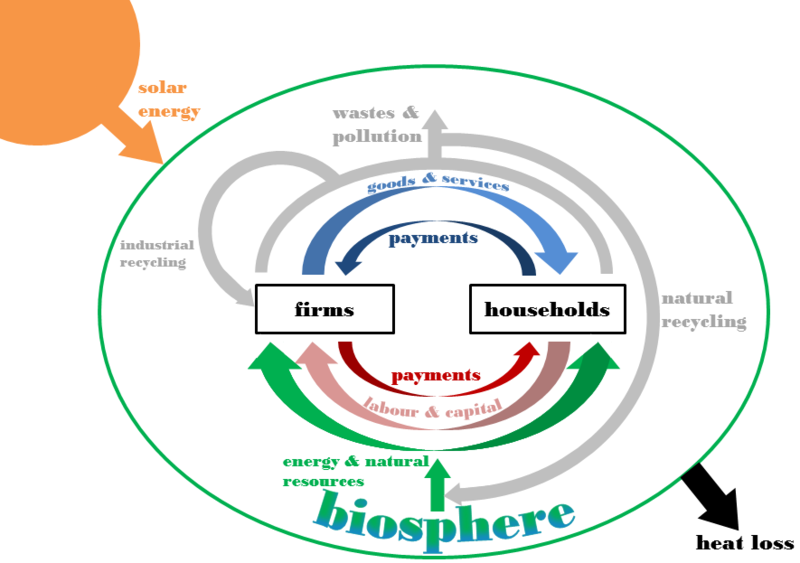 If the circular flow model of the economy system is to satisfy the laws of thermodynamics, the system cannot be a ‘whole’, but instead sits within a larger system, the Earth, which is bounded by biophysical limits (Figure 2). These limits mean that there are indeed limits to scale of the human economy relative to the natural economy, and that aggregate human well-being is ultimately constrained by these limits. So we have two alternative viewpoints – one which stresses the importance of the environment for human well-being, and another which argues that the environment perhaps isn’t so important after all. Raudsepp-Hearne and her colleagues argue that in order to resolve the paradox, ecologists need to direct efforts into understanding the links between ecosystem services and multiple aspects of human well-being, trade-offs and synergies between services, the role of technology and better forecasting of changes and potential tipping points in the future supply of ecosystem services. That being said, I can’t help but feel that the discovery of ecological tipping points – especially at the global scale – may not be something to cheer about while the earth remains on its unsustainable trajectory with no Plan B in sight. It’s hard to disagree with the importance of this research direction, but perhaps the most interesting outcome of Raudsepp-Hearne’s article is that the subsequent discussion has shown how polar opposite conclusions can be drawn as to why and how the environmentalist’s paradox will eventually be resolved, depending on your pre-existing view on humanity’s relationship to the environment. It might seem tempting just to disregard the viewpoint which considers the maintenance of the environment as unnecessary for human well-being, but as John Gowdy and colleagues argued in a recent essay3, it’s worth remembering that mainstream economics perceives the world as in Figure 1, where physics doesn’t exist and the environment is often considered as ‘external’ to the economic system. This means that the vast majority of economic decision making is driven by an unrealistic view of the world, which has obvious consequences for biodiversity conservation. Given these stark differences in the preanalytic visions of mainstream economists and ecologists (Figure 1 and Figure 2 respectively), it seems that working to resolve the environmentalist’s paradox is only the first step, and that a more systemic perspective is needed to understand how the world is to move onto a sustainable pathway. Raudsepp-Hearne and her colleagues suggest that cross-disciplinary discussion is needed to create a ‘science of sustainability capable of integrating the complexities of culture, human well-being, agriculture, technology, and ecology’. But such a discussion also needs to include a critical analysis of many of the theories which underpin modern economics, in order to become compatible with broader goals for biodiversity conservation and long term sustainability. Ecologists and conservation scientists in particular have a hugely important role to play in advancing economic thinking – but as Gowdy points out, it can be difficult for ecologists ask the fundamental questions required because of the differences in language used between disciplines. Paul Ehrlich has argued that ecologists should become economists, and vice versa – but while a change in profession might not always be possible, there is still an urgent need for much bigger and louder conversation between ecologists and economists if we are to truly build a science of sustainability. There are, of course, many examples of ecologists and economists working together – for example, the annual The Askö Meetings which have built a shared understanding by leaders in both fields. Realistically though, these conversations shouldn’t be taking place just once a year in a remote island off the coast of Sweden (although it does sound lovely), but in conferences, within and between university and government departments, in tea rooms, lecture theatres and everywhere that ecologists and economists could potentially cohabitate. Of course interdisciplinary work doesn’t just happen if you throw people into a room together, so what else could be done? A buddy system? Or a trip to the pub? I don’t know what the answer is, but whatever happens, this is a conversation that needs to happen sooner rather than later. Now is the time to be part of the development of a Plan B. 2 Daly, H. E. and F. Farley (2010). Chapter 2: The Fundamental Vision. Ecological Economics: Second Edition, Principles and Applications. Washington DC, Island Press.